Anyone can put fire out with water or a fire extinguisher – but DARPA, the sci-fi arm of military research – wanted to do something a little different. They invented a system that kills fire with nothing more than sound. The system is meant to be used on fires in small spaces, such as the cockpit of an airplane. 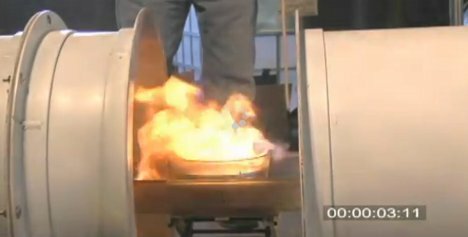 In the demonstration video below, a small liquid fuel fire is effectively extinguished within a few seconds. The concept works by placing speakers on either side of the fire. The acoustic field they create works to both increase air velocity and increase the rate of fuel vaporization, both factors that lead to the flame becoming unsustainable, and eventually just going out. It’s definitely not ready for prime time just yet, but we’re hoping DARPA plans to develop this idea to the point that we can all have fire-killing sound machines in our homes. See more in Science Fiction or under Science. July, 2012.